Remember a couple of weeks ago when I was blogging about wanting to get some guineas? Well, a local blog reader friend emailed to say he had one that I could have, to see if I liked having a guinea and wanted to get some more. Huge thanks to Sunnybrook Farm! The first day he seemed kind of upset. He continually squawked (or whatever you want to call it - they sound like a rusty gate hinge). Then he got quiet and I looked out and saw him on the front porch, looking in. I've been giving him lots of treats - he especially seems to like bits of tomato. I think his head looks like a mummy, so we named him Tut. Sunnybrook Farm was also kind enough to send us home with a bunch of kale. 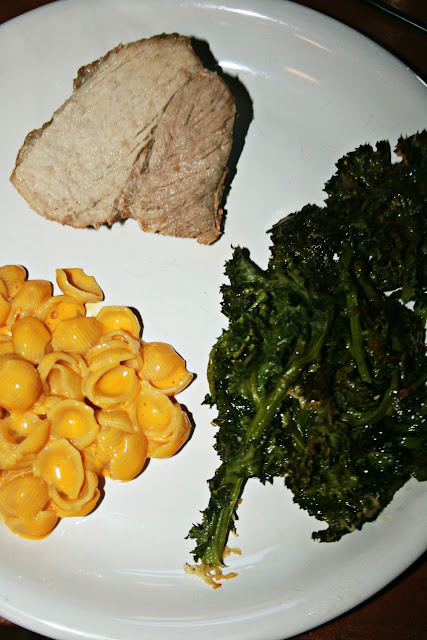 I already had a pork tenderloin in the crockpot, so we had that with some roasted kale (tossed with olive oil, parmesan, sea salt and pepper) and some shells and cheese. It was delicious - and the twins LOVE kale. Cort had three helpings and Reid had two. I will have to be sure to plant kale next August for one of my winter crops! What do you think about guineas, readers? They are an odd looking bird for certain! They are supposedly great for keeping tick populations down (remember last summer we had to treat Pierce for lyme disease). They also act as guard birds, making a big ruckus over anyone new showing up. And you can eat their eggs, if we were to get a female at some point. It is so cool that one of your reader had a hen for you. Tut sure looks cute. I LOVE guineas, they have so much personality! They really do keep the tick population down and they love to gobble grasshoppers as well. Their eggs are tasty and they make a good meat bird if you fancy that...some people say they taste rather like quail. Yay for homegrown kale! I am for anything that will keep ticks away. You need to get more of those guineas. Congratulations on acquiring Tut... and that yummy looking kale. What nice people they are to think of you! By now he has settled in and is a happy resident . . I would enjoy company like Tut in my world . .
What are you going to do with him Lisa? I think guineas are fantastic tick eaters..I've never owned any, but know some folks who swear by them for that purpose. King Tut is pretty! 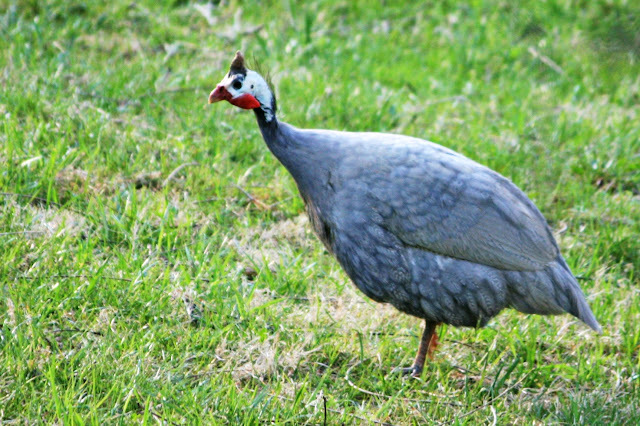 I don't know anything about guineas, but it sounds great that they keep down the tick population and act as guard birds. Kale is so good for you--great that the twins enjoy it! oh, i hope you add more for him! 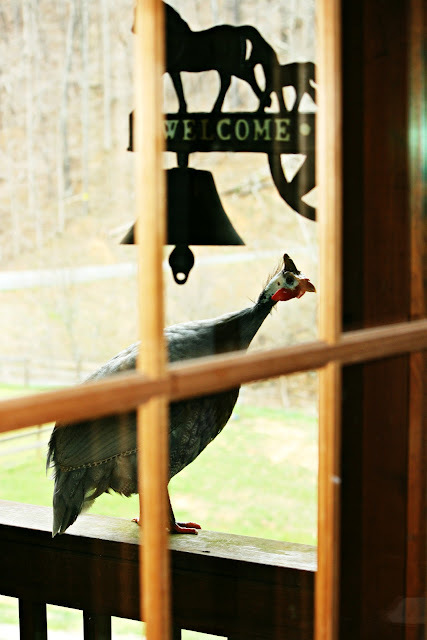 i photographed what i thought was a wild turkey the other day, perhaps it was this!! i'm a farm girl want-a-be!! We have experience with guineas because our neighbors on two of our farms over the years have had them, and they came to visit frequently. They are noisey, but they are beneficial..they eat ALOT OF BUGS!.. ticks being the worst offenders. If I had a bigger coop I would have six or so here at This Old House too. I'd say atleast get Tut a friend, they don't like to be alone. And, they can be hunted by predators, fox, coyote, hawk, etc... so giving them a place to roost, where perhaps you can close them in at night is safest. I don't know that I've ever seen your barn, it's possible that you can give them a place in the barn to roost. Guineas are great! They are the dumbest creatures you can imagine, but they are entertaining and we did not have a tick problem last summer. I also hear they eat squash bugs. Glad that he finally has a name and the head does have a strange mummy look to it. Happy bird! It was nice to have you guys over for a visit and Dusty has eaten most of his hay, he looks for a treat when he gets to his stall and your hay is the current treat. Well, he sure is an interesting looking bird! I hope he keeps your tick problem at bay. OK, now I feel bad for telling you not to get them because they are so noisy! I like your Tut...he's cute. I bet he's lonesome too, and could use some guinea company. Oh --how I love Tut... Perfect name for your new guinea... Sounds like he is adjusting well. I love kale too--but haven't had it in years.. My mother used to make it ALOT... Actually I like most all of the greens out there. I always get turnip greens when we go to Cracker Barrel. Yes indeed, it is an odd bird! And looks like he would like to come in. Considering the ticks, the guarding and warnings, and the future eggs, it looks promising. He does not fly, so you will keep him around by feeding him, or do you have a fence and a coop...do you still have your other chickens, and does he get along with them? I LIKE the name! This is awesome of the farm to do this. I should look into getting some guineas. I don't like the thought of ticks on my grandchildren. Kale sounds so yummy. I don't know if the kids will like it. I should try and make a batch and see how it goes over. Such an interesting looking bird! I'd love to have one, but I'm sure my dogs would terrorize it. My daughter is always raving about kale. I think I will have to try it soon! Oh how I wish I liked kale. cool picture of the guinea on the porch! He looks like a cool bird! Great name. The shot of the guinea peeking in the window totally cracked me up! I think Tut is great and will be a fantastic addition to your family. Guineas are wonderful tick eating machines! How neat that one of your readers gave him to you. I think he needs a friend :) I believe they are social beings. We love Kale over here as well harvesting a bit more this weekend as well. Loved my visit to your blog. Didn't know that guinea hens make such good guards. They are a funny looking thing. That kale sounds good but I heard that it can be a little tough, sounds like you sorted that out with no problem. He is very cute! And I really like the name :) We got our guineas after my husband had to be treated for Lyme Disease. They have done a good job of eating up the ticks out here. We still get some occasionally, but not near as bad as before the guineas. And if you can find their eggs, they are delicious! Tut looks a bit unusual. I bet your boys love having him around! He is very interesting and I like his name. If they go after ticks that is definitely a plus! I've never really been around them but he sure sounds like he has a BIG personality! I think my favorite way to eat kale is as chips. But I read somewhere if you 'massage' the raw leaves vigorously they work quite well in salad. I haven't tried that yet, though. Hope you're having a happy thursday. They are an odd looking bird. That's cool they help with ticks! I learned something new with this post and the comments on guineas!